Need to write a Bartender Resume? If you're a Bartender, you know what your job entails. Your primary duty is to serve alcoholic drinks to customers who are of age. You may also be asked to serve non-alcoholic drinks or food to customers who are under 21 years old. You're probably employed by a bar, nightclub, chain restaurant, upscale eatery, or by a private residence. Working usually means staying up during late hours or even all night, although some individuals prefer doing day shifts since work is less busy. The question is, now that you're looking for a position, can you find a resume writer who understands your occupation? A writer who talks the language of call drinks and virgins, point-of-sale (POS) software, and social perceptiveness? A writer who can craft a bartender resume that puts your best foot forward and scores the interview in a highly competitive marketplace? Former recruiter David Alan Carter recommends the following resume services for Bartenders... each with a Better Business Bureau score of "A" or better. www.resumewriters.com | Reasonable pricing, standout writing, and an interview guarantee from the largest network of resume writers on the Internet (representing more than 5 dozen career fields and industries). Guaranteed interviews within 60 days. The BBB gives them an A+ rating. Considering a Career Move into Bartending? If you're considering a move into Bartending from either a closely related field or from a totally unrelated profession, you'll be looking for a transitional resume -- and a talented resume writer to handle the assignment. Transitional resumes are some of the most difficult resume projects as they require a writer knowledgeable in at least two professions -- and the ability to identify transferable skills from one to the other. What You'll Do: The job of a bartender will require you to be familiar with many types of drinks and the ingredients used to make them. You will need to memorize many cocktail recipes, sometimes numbering in the tens or hundreds depending on where you are employed. You also need to be able to make the drinks very fast since bars can get very busy during peak hours. Before serving alcohol, you must check customer identification to make sure everyone is of age. Making people happy is an essential part of the job that involves providing fast, high-quality customer service. This means greeting and being friendly to patrons, pointing out drink and food specials, handing out menus, keeping the bar and workspace clean, taking payment and giving back change, and more. You might also be asked to order bar supplies and clean up after hours. 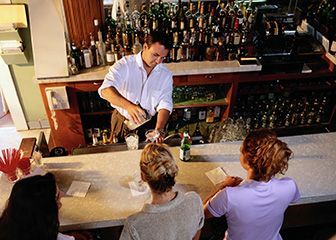 Education and Training: There are no educational requirements needed to serve people drinks in a bar. However, some establishments will only hire people who have taken bartending classes. Individuals who get the job are usually those who are very social and show lots of skill mixing drinks at high speeds during a job audition. You must be at least 18 years of age to serve alcohol, but most bar owners would rather hire people 25 and older because they don't want to risk getting into any legal trouble. If you work in a restaurant as a server, cook, dishwasher, or bar helper, you can be promoted to serving drinks if you choose to switch jobs. You will be very suitable for bartending if you have great people skills and lots of energy. The Future: The bartending profession is expected to grow at about 9% through 2020, which is a slower rate of growth than the average profession. Expect competition to be particularly strong in fine dining restaurants where tips tend to be larger. The Pay: As per the U.S. Bureau of Labor Statistics, the median hourly wage was $9.06 in 2011, with the top 10% of bartenders earning over $15.00 per hour. Still interested in pursuing a position in Bartending? Great. The next step is to prepare for a consultative telephone interview with your resume writer. Treat the coming job search like the business it is, and you'll do fine.